The utilization of intermittent renewable energy sources needs low-cost, reliable energy storage systems in the future. RFBs are promising with merits of independent energy storage and power generation capability, localization flexibility, high efficiency, low scaling-up cost, and excellent long charge/discharge cycle life. Current RFBs are dominated by vanadium chemistry. To enhance the energy storage capability of RFBs, it is necessary to find alternative energy-rich electrolytes (high concentration of active species and with high cell voltage). (Minireview) Toward high-voltage, energy-dense and durable aqueous organic redox flow batteries: role of the supporting electrolytes, R. Chen*, ChemElectroChem (2018) DOI: 10.1002/celc.201801505. Redox flow batteries for energy storage: a technology review, R. Ye, D. Henkensmeier, S.J. Yoon, Z. Huang, D.K. Kim, Z. Chang, S. Kim, R. Chen*, Journal of Electrochemical Energy Conversion and Storage (2018) 15, 010801. High‐Voltage and Low‐Temperature Aqueous Supercapacitor Enabled by “Water‐in‐Imidazolium Chloride” Electrolytes, A. Tatlisu, Z. Huang, R. Chen*, ChemSusChem 11 (2018) 3899. “Water-in-ionic liquid” solutions towards wide electrochemical stability windows for aqueous rechargeable batteries, Y. Zhang, R. Ye, D. Henkensmeier, R. Hempelmann*, R. Chen*, Electrochimica Acta 263 (2018) 47-52. Redox flow batteries: fundamentals and applications , R. Chen*, S. Kim, Z. Chang, Redox: Principles and Advance Applications, InTech (2017) 103-118. Ionic liquid-mediated aqueous redox flow batteries for high voltage applications, R. Chen*, R. Hempelmann, Electrochemistry Communications 70 (2016) 56-59. 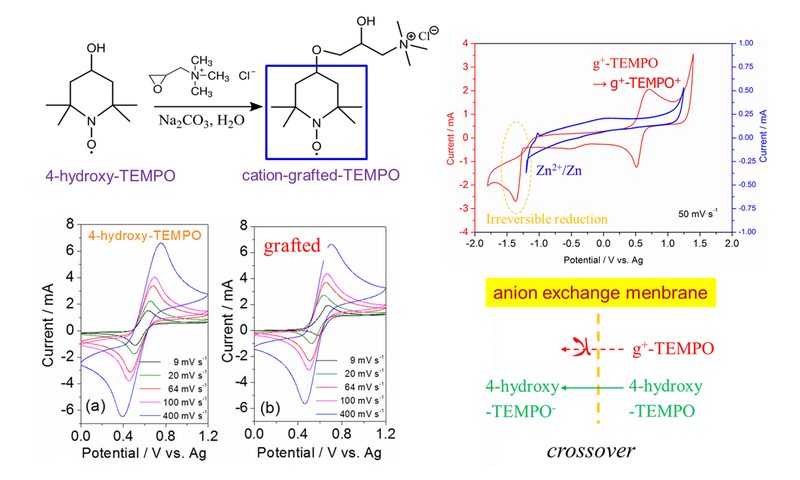 One-step cationic grafting of 4-hydroxy-TEMPO and its application in a hybrid redox flow battery with a crosslinked PBI membrane, Z. Chang, D. Henkensmeier, R. Chen*, ChemSusChem 10 (2017) 3193-3197. 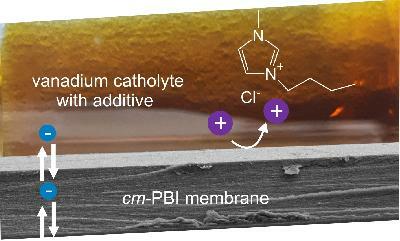 Improved all-vanadium redox flow batteries using catholyte additive and a cross-linked methylated polybenzimidazole membrane, R. Chen*, D. Henkensmeier, S. Kim, S.J. Yoon, T. Zinkevich, S. Indris, ACS Applied Energy Materials 1 (2018) 6047.